A woodworking machine with a single cutter head that planes one surface at a time of a piece of timber. Also called surfacer. Used for straightening and squaring timber. Also know as a Surface Planerand sometimes as a Buzzer. A good looking and efficent surface planer. The usefulness of thes machines is directly proportionate the the overall length. A short machine is very useful but as they used to say when I were a lad, "a good big un will beat a good little un". For information on how to use a jointer have a look at my jointer page. In strict terms a jointer can be any tool that aids in making a joint. Bricklayers have them, concretors have them and so do pipe layers. In woodworking the term jointer was first used to mean a large hand plane that is used for truing up the edges of timber to make neat joints. 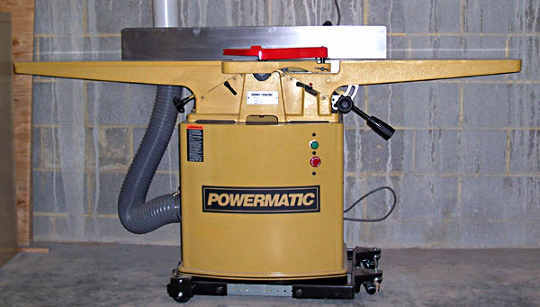 A surface planer, with a single cutter head used for making a straight face side and face edge on rough sawn timber. This is called a jointer in the US. The photos on this page are of jointer planer machines. A thickness planer, or thicknesser is a machine with a single cutter head that takes the previously jointed timber an plane it to a parallel depth and thickness. In the US this is sometimes abbreviated to "Planer"
Given that these machine have only one cutter head, there are a range of woodworking machines called "combination machines" or "Under and over machine" that do the two jobs in one. With these machines the top tables of the surfacer pivot away and the machine can be used as a thicknesser. Other planing machines, namely four sided planers which have four cutting heads do the lot in one hit. (Apart from straightening the timber). What you have is what you still get with a four sider. Increasing in sophistication and cost are machines with more heads still that produce material like T&G floorboards. I used to have a small combination bench saw that had a 4" jointer planer at the side. I bought it cheap at an auction and I only ever intended using the saw. I used it on site when doing what we call second fix, or trim Carpentry as my US mates call it. Being used to using a jointer in the workshop that was over seven feet long I didn't think the tiny jointer would get much use... but it was there so for a couple of things I used it, and then some more etc. etc. It is surprising how handy these small machines are, and the longer you have them the more uses they are put to.